For the past 2 weeks, the excitement leading up to the 10th anniversary of THE WALKING DEAD this October has been built up as we’ve revealed each of the 10 connecting covers to THE WALKING DEAD #115. 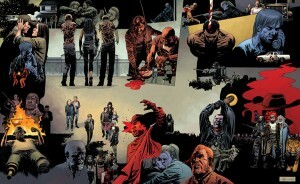 Today, the final cover was revealed on the Image Comics website as well as The Walking Dead.com. 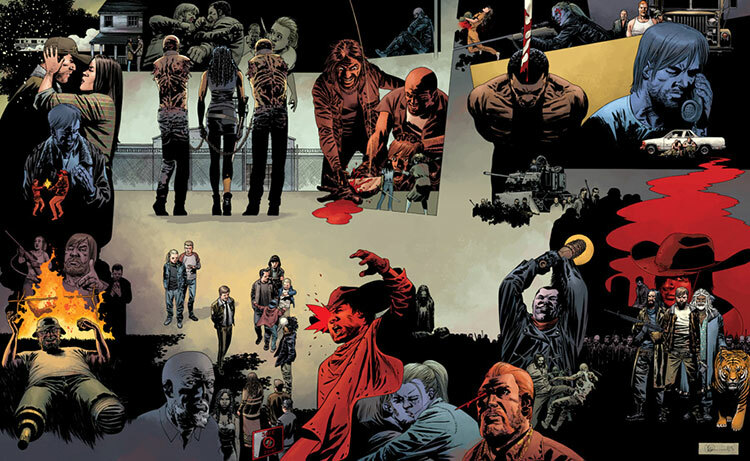 With artwork by series artist Charlie Adlard, colored by Dave Stewart, each cover to THE WALKING DEAD #115 depicts a key moment from each year of the long running series, and connects to form one massive retrospective of THE WALKING DEAD. THE WALKING DEAD #115 goes on sale on October 9, 2013 and is available for pre-order with local comic book retailers now! This entry was posted in Columns and tagged charlie adlard, davew stewart, IMAGE COMICS, Robert Kirkman, THE WALKING DEAD. Bookmark the permalink. Follow any comments here with the RSS feed for this post. Post a comment or leave a trackback: Trackback URL.